I'll begin with a big thank you to all those friends, and fellow bloggers, who were racing or as a spectator that gave me words of encouragement during the race. 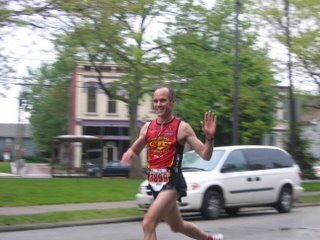 Also, during the race I made it a point to thank and wave to all the volunteers, traffic patrollers, and the fans that were clapping and cheering as I went by. I think with all the words of encouragement and a sense of being thankful I was helped to have fun and run a great race. My mile splits was an indication of the kind of rolling course it was. First mile always goes fast because of excitement and adrenalin. And a good down hill helps. What goes down must go up! Found my grove and maintained the pace! Before this morning my goal time was to finish around 1:20 to 1:24 but early before the race I thought why not finish in a sub 1:20 time. That was good thinking! Thank you Liz for the photo. And yes that is a real smile! WOW!!!!!! 3rd overall!! that is SO GREAT!!! Yeahhhhhhhh! Congratulations!! WAHOO! What? 3rd overall??? That is terrific!! Nice you just made the plan this morning!! WOW Papa Louie!!! WAY TO GO! I am in awe!!! You looked solid as I was pacing my group--I was excited to see ya! Awesome job Lou! I got the greatest pic of you! Awesome race!!! If it wasn't for your CTC jersey, I think we would have missed you since you were absoulutely FLYING by. Doesn't it feel great to find your groove like that? Congrats on a great race, it's a good sign when your body is ready for better than what you initially planned for. WOW! What an awesome race! Many, many congrats! Super aweseom!! You are indeed FAST, even the pic proves it! Congrats on the awesome results! What a fantastic time!!!! Congratulations! I am looking forward to watching you crush the marathon come October! Amazing pace and times! You are a very fast and consistent runner. Good job and congratulations! Wow. Those are some seriously smoking miles! I feel like a turtle smoking weed. An amazing time! Best of all you are all smiles and you said you were thankful. Good vibes! Way to go, you fast hare! Holy SMOKES! That is just smokin' fast and 3rd overall!! Impressive to say the least. Congrats on a great run! Wow! The smile and pace say it all! Congrads!!!!!! What a great photo!!! And great race results. Good for you! One of these days, we have got to meet up on a race course somewhere! PS - Isn't Elizabeth the best photo taker, ever? Cleveland Bikes to Work Day! I am Wired to Win! Woo Hoo! It's Taper Week! !